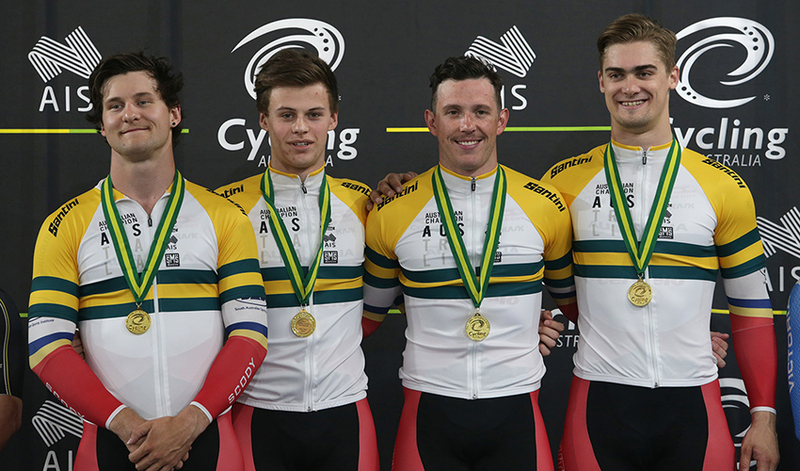 Thomas Clarke claimed his first Australian title in style on the opening day of the 2018 Australian Track Championships combining with Matthew Glaetzer and Patrick Constable to snare the team sprint crown, the third in a row for South Australia. 22-year-old Clarke a bronze medallist from the 2014 Glasgow Commonwealth Games in the Tandem sprint has long been a contender on the national stage, including a bronze medal in the keirin two years ago. The team sprint victory though is his biggest breakthrough on the single seater bike. A time of one minute 1.943 seconds in the kilo time trial was bitter sweet for Clarke, as while a PB and his first time under one minute two seconds he fell agonisingly short of the podium by a tenth of a second. With a PB and national title to his name Clarke heads in to the sprint and keirin relaxed as he eyes the 2018 Gold Coast Commonwealth Games in April in the Tandem events. First national title what does it mean to you? Winning my first National title is really special. It was great to line up with Pat and Matt in final and know that we had to put it all on the line. After they laid down an awesome time in the heat with James Brister I knew I had a lot to live up to, but I'm glad we were able to execute a good ride. Pretty quick time just one tenth of a second off the Australian Championship record how did the ride go for you? The ride itself went off without an issue - even if I was feeling a little rough after the kilo just beforehand. Riding first wheel out of the gate is certainly not my best position, but I knew that I just had to rip it as hard as I could to try and deliver Pat and Matt as fast as I could into their own laps. To win with the likes of Matt Glaetzer and Patrick Constable does that make it even more special? Winning with Pat and Matt was an awesome experience. They obviously have a massive reputation with being a great combination, so I really wanted to be able to put myself out there to create a cohesive team. We all really wanted that third team sprint title in a row for South Australia and being able to put it together on the night was a humbling experience. Also finished fourth in the 1km time trial in 1:01.943, just one tenth of a second off the podium happy with the time? I had a personal goal of trying to crack sub-1:02.00 for the kilo so I was stoked with I crossed the line to see that I has just done it. I haven't done a kilo since U19, so it was really anyone's guess as how it was going to go. I have been doing a fair bit of kilo work on the Tandem in the lead up to Gold Coast Commonwealth Games as it one of the main events for our bike, so I was really happy with the result. Being that close to the podium was a little bitter/sweet as it would have been pretty special, but the competition was really tough, and I was still really happy with my overall time. Was a busy day for you with team sprint and the 1km TT how did you find racing up for the team sprint final after the kilo? It sure was a full-on day of racing with both of those events. I was pretty shattered physically after the kilo ride, but I knew we still had a job to do in the final of the team sprint. We (Patrick Constable & Matthew Glaetzer) just had to mentally reset, reorganise our priorities and just focus on the job that had to be done in the team sprint later that night. Sprint and keirin coming up what are your goals there? Honestly, I've come into this week with some pretty relaxed expectations apart from executing my racing to the best of my abilities. Grabbing a few PB's would be nice but we have all had a few tough weeks of training in our last training block. With the Commonwealth Games coming up we didn't really have time to freshen up too much for Nationals when the games are such a big target, so we have come in with whatever form we had and hoping that will be enough to get us over the line against some really tough competition.